Join fellow TR Register members for a five-night stay in Scotland. Explore the Trossachs, Glencoe, Loch Fyne, Loch Tay as well as a distillery visit to the Famous Grouse experience. Enjoy fabulous roads and scenery as well as a day off from driving when we recommend a boat trip on a historic steamer. We have carefully selected the tour dates in order to follow on from the Bo’ness Revival weekend. This popular event has been adopted as the club’s Scottish weekend. We hope you will be able to attend the event and join the tour to make for a superb stay in Scotland. The village of Aberfoyle is an ideal base to explore the Loch Lomond & The Trossachs National Park. It is a popular holiday village with an attractive main street and well served with individual shops, cafés and restaurants. Learn more about the area’s natural beauty and history at the Trossachs Discovery Centre. 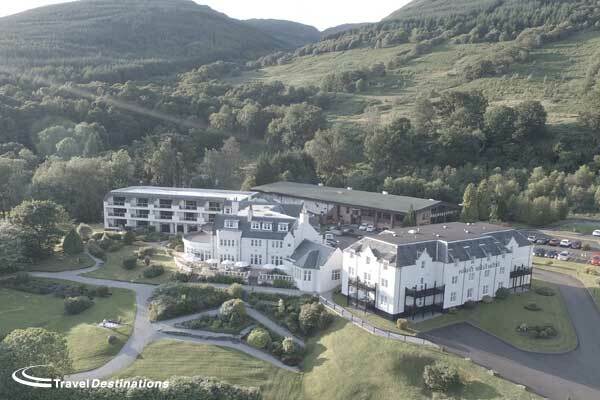 Enjoy five nights at the four-star Macdonald Forest Hills Hotel & Spa in Aberfoyle. The hotel has magnificent views of Loch Ard and is situated next to the Queen Elizabeth Forest Park. Arrive at the hotel from 14:00hrs for check in. Why not enjoy the hotels swimming pool and spa facilities or take afternoon tea, alfresco or by the fire, in order to relax and unwind after your journey. Dinner is included at the AA rosette awarded hotel restaurant this evening. After breakfast you’ll take a drive through the Trossachs and along Loch Tay. You will arrive in the pleasant market town of Aberfeldy for a coffee stop. You then have a picturesque drive down to Crieff, where the Famous Grouse whisky experience is based. There is an interesting visit of the distillery if you wish to take the tour, which culminates in a tasting or gift to take away. You continue on the enjoyable roads back to the hotel this afternoon. Dinner is included at the hotel this evening. Follow your roadbooks on the spectacular route via the Bridge of Orchy and onto Glencoe. Once up in the Highlands, you’ll have the chance to do your best James Bond impression at one of the numerous stunning photography locations. The Bridge of Orchy is a great spot for refreshments on the way to Glencoe. Dinner is included at the hotel this evening. Today no road route is planned. Why not take a cruise around Loch Katrine on a 118 year old steamer ship. Learn about the Loch itself as well as the historic vessel you are travelling on, which still has its original expansion engine, visible to passengers during the cruise. Dinner is included at the hotel this evening. Enjoy your penultimate day in Scotland with a trip over to Loch Fyne, the longest of the sea Lochs. The club have arranged privileged parking in front of the iconic Inveraray Castle, situated on the shores of the Loch. This evening you have dinner included at the hotel. After breakfast at the hotel check out by 11:00hrs, ahead of your return journey.